There is one powerful aspect of all of our lives which refuses to conform to the laws of nature. 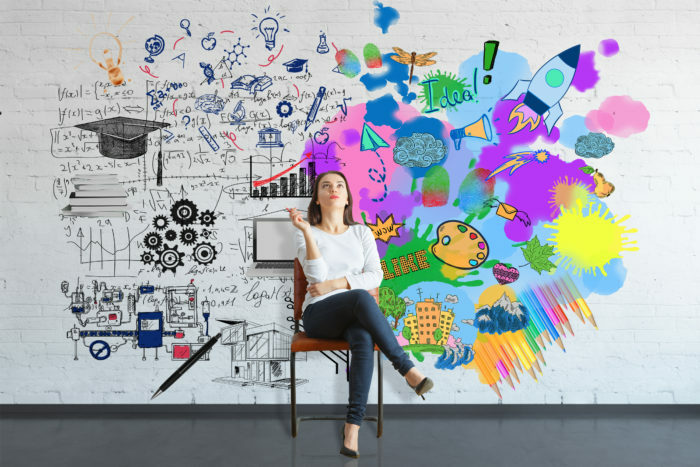 This part of your life has the ability to make or break your marriage, direct your career choices, drive your friends away, or keep them connected to you through thick and thin. It is rooted in your physiology, defines your humanness, and yet makes you a human unique from every other. Despite its incredible power, it is nevertheless largely ignored and suppressed by many people. I am talking, of course, about emotion. Why Do We Ignore Our Own Feelings? Many of us view our feelings as an unnecessary burden. We have no idea how useful our emotions are. Emotions are confusing. They don’t make sense to us so we ignore them. Not surprisingly, these two reasons perpetuate each other. The less attention we pay to our feelings, the less we learn how they work and how to use them. That only serves to make them more confusing. Then the problem is perpetuated in another, even more, enduring way. If your parents were confused by your feelings and ignored them (Childhood Emotional Neglect or CEN), then they inadvertently taught you to do the same. Growing up blind to your own feelings, you will also be blind to your children’s feelings, and you will raise them as you were raised. On and on it goes, with one generation after another learning little about how their own feelings work and what to do with them. One generation after another, expecting feelings to be logical, make sense, and conform to the laws of nature. Causing more and more people to become frustrated and baffled and, lacking a way to cope, choose to ignore them. Think Newton’s Laws of Gravity, the Laws of Motion, or the Relativity Principle. These laws of physics allow us to understand, define and predict our complicated world. They’re all based on formulas and can be demonstrated by mathematics. They make sense. They’re logical. As complex as those principles may be to thoroughly understand, basic knowledge of them at least provides us with guidelines. We know what to expect when we drop an apple or push a chair, and generally why it happens. It’s wrong for me to be angry about this. How can she possibly feel that way? That’s a dumb way to feel. You just said you’re happy, and now you’re not. Which is it? I need to stop feeling this way. With emotion, there is no right or wrong. Our emotions are biological. They originate in our brains, and they are involuntary. Because of this, morals and ethics do not apply to them. The Takeaway: Never judge yourself for your feelings. Instead, judge yourself for your actions. Emotions can be both a help and a burden at the same time. Feelings can be heavy and can weigh on us. Yet they are vital sources of information. They are our body’s messages, and if we listen, we are informed and directed. The Takeaway: View your emotions as your friend, rather than your enemy. Opposite emotions can co-exist within the same person, about the same thing. It’s entirely possible to feel both pleased and disappointed about something; happy and sad; fascinated and repulsed, love and hate. The Takeaway: Don’t oversimplify your feelings or anyone else’s. The more your emotions hurt you, the more they can help you. Our most painful feelings carry the most powerful, most vital messages. “Do something,” they tell us. “Face something, say something.” Our pain wants us to look at what we’d rather not see, and accept what we’d rather not know. The more painful the message, the more important it is to listen. The Takeaway: Your emotions have great value, especially the most painful ones. Accepting and welcoming your emotions actually makes them go away. It’s true. Feelings that we avoid feeling have great staying power and tend to get stronger. The very best way to make a feeling fade is to welcome it, sit with it, and process it. Try to understand its cause. All of these steps take away its power. It will stop running you, and you will instead take charge of it. The Takeaway: Stop avoiding an emotion if you want it to go away. Feelings cannot be true or false, right or wrong, smart or stupid. You cannot choose them. Your body chooses them for you. They just are what they are, period. Your feelings are your greatest motivators and guides. They are messages from your body, that’s all. They may hurt, but they can’t hurt you. Listen to your feelings, but don’t give them too much power. It’s your responsibility to manage them, share them with care, and try to understand them on their terms. It’s your responsibility to learn how your emotions work so that you’ll understand how your children’s emotions work. Then, instead of teaching them to ignore their feelings, you can teach them how to feel, name, manage and share their feelings: the exact opposite of Childhood Emotional Neglect. That’s you, stopping the cycle of confusion and avoidance. That’s you, defying the laws of human nature. And creating a different future for us all. 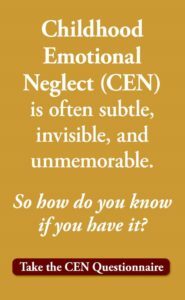 To find out if you grew up with Childhood Emotional Neglect Take The Emotional Neglect Questionnaire. It’s free. 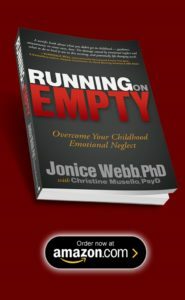 To learn more about emotions, how they work, and what happens when you ignore them, see the book, Running on Empty: Overcome Your Childhood Emotional Neglect. 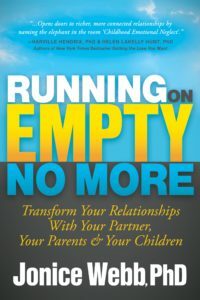 To learn how to use your feelings in relationships and teach your kids about emotions, see the book Running On Empty No More: Transform Your Relationships. Some parts of this article originally appeared on PsychCentral.com and have been republished here with the permission of the author.